Blog — International Field Studies, Inc.
Where are they now? A Spotlight on our Previous Interns: Jade Reinhart! Every so often, we like to look back at our interns and see how they’re doing after they’ve left Forfar. Today we’ll be following up on Jade Reinhart! Jade worked at Forfar during our 2017-2018 season. Her hobbies include fitness, longboarding, and volunteer bird banding. She followed her love of marine science after leaving Forfar, and now she lives at Jekyll Island in Georgia working as a Coastal Educator for the University of Georgia. Jade says that her time at Forfar got her interested in conservation non-profit management. She hopes to study this in grad school and eventually make it her career. Conservation is a huge part of what we do at Forfar, and we’re so glad we could introduce Jade to this topic! Jade’s time at Forfar helped her develop different skills that she still uses today. Her work with seagrass and our coral propagation site (which you can read more about here) helped improve her dive skills. She also honed her flexibility and problem solving skills as she led students on field excursions throughout the island. These skills help her teach students about the importance of conservation. Enjoy teaching the next generation of marine scientists, Jade! The college application process and selecting a major can be overwhelming, especially at such a transitional stage in life. One way to center yourself and your goals before college is to take a gap year —a yearlong break between high school and college. A gap year can help develop stronger academic skills and increase employability. 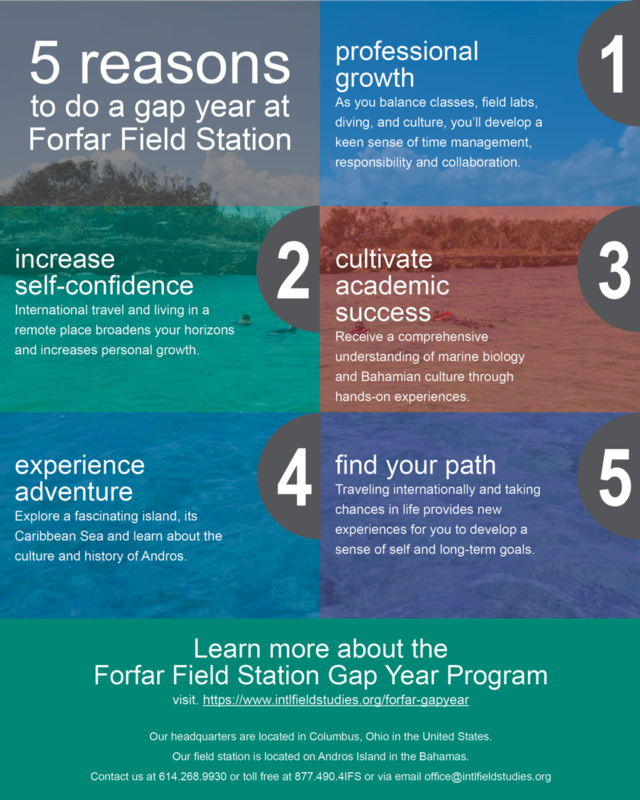 Here are the top five reasons to consider a gap year experience at Forfar Field Station. Although you may not be working full-time during a gap year, you can still grow professionally. At Forfar you’ll learn skills that will help you in the workplace, as well as, boost your resume. As you balance classes, field labs, diving, and culture, you’ll develop a keen sense of time management, responsibility and collaboration. Our Forfar Marine Science Program includes internationally recognized certifications in PADI Open Water scuba diving, PADI Advanced Open Water diving, Leave No Trace, ACA Kayaking, and Wilderness First Aid. These certifications equip you with life-long skills and help you stand out to future employers. During your stay, you’ll earn tangible professional experience and service hours working with Bahamian nonprofits and government organizations. This is an opportunity to give back through volunteer work with trail maintenance, mangrove restoration, invasive species control, and more. International travel and living in a remote place increases self-confidence through personal growth. In general, students who take gap years report higher self-confidence. The Forfar Gap Year program is no exception. Situated far from the main centers of population, this cross-cultural experience teaches respectful interactions with people from different cultures. Students who take a gap year report higher academic success when they enter college. Our curriculum provides a comprehensive understanding of marine biology and Bahamian culture through hands-on, experiential experiences. The class schedule splits time between classroom lectures and outdoor adventures and labs. Excursions to snorkel on the fringing barrier reef, swim in a blue hole, or perform a marine invertebrate lab on the beach, reinforce classroom lessons. Our class material fosters a deeper appreciation of marine science as students live and work on Forfar Field Station. A gap year at Forfar Field Station is a chance to live on a remote island in the Bahamas; and have a life-changing adventure. A gap year is an opportunity to experience adventure and mature. Our Forfar Marine Science Gap Year Program does just that. It provides you with the opportunity to explore a fascinating island and learn about the culture, history, the mangrove forest of Andros, and the Caribbean Sea. Andros has dozens of fascinating places to explore. The island has the largest concentration of fresh blue holes in the world and is located right next to the Tongue of the Ocean. With a wide variety of tropical fish, reef sharks, sea turtles, and unique corals, Andros is a great place to dive. Andros also has many tide pools and subtropical forests, where you can see more than 50 species of wild orchids. You can learn more about Andros here. Traveling internationally and taking chances in life provides new experiences for you to develop a sense of self and long-term goals. In our program, you can explore different fields such as marine biology, geology, botany, island ecology, invertebrate zoology, SCUBA diving, and more. Exploring these fields can help you narrow down your search for the right college major or future career path. Entering into college with a more concrete idea of your educational goals, gives you a leg up on other students who are still trying to decide what they want to pursue in college or where to focus their time and energy. Taking a gap year to explore what you want out of life, both professionally and personally, can be a well-deserved break from societal pressures. People often expect high school students to jump right into college, but going back into the academic grind could be a mistake for some individuals. Students who take a gap year often come back feeling recharged and refocused. Andros is a wonderful place to explore and expand your horizons, and our program will give you the resources and opportunities to succeed during college or with your professional career. Interested in learning more? You can visit our website, download our program guide, or apply now. Feel free to email us at office@intlfieldstudies.org with any questions. Where are they now? A Spotlight on our Previous Interns: Erin McGrady! Today we’re taking the time to reflect on a previous intern, Erin McGrady! Erin worked at Forfar from December 2001 to Spring 2003. At Forfar, she developed a love of teaching that carried on after she left Andros Island. “I had no idea what I wanted to do when I arrived (at Forfar) but by the time I left, I felt called to teaching,” Erin told us. “After my internship, I went back to school to get my Masters and then taught middle school Physical Education for ten years. 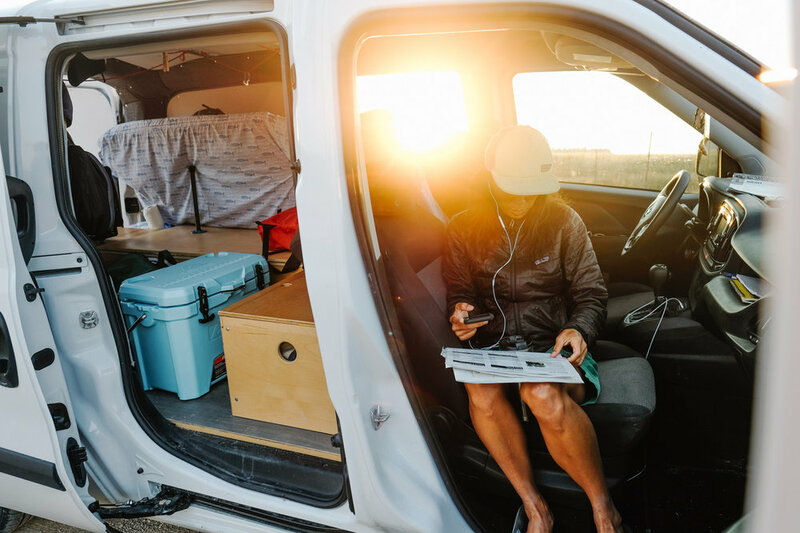 I'm no longer teaching but the adventure/eco-tourism aspect is still a big part of my life as a freelance writer and photographer living in a van.” We’re glad that Forfar spurred her interest in education. Erin says her time at Forfar gave her professional experience she used in her teaching career afterwards. Forfar taught her how to think on the fly, develop public speaking skills, working with many different people, and more. Erin also created connections to people on Forfar that still last to this day. She told us that the friendships she made were her favorite thing about her internship. Erin has worked as a middle school PE teacher, a website designer, and a coach after she left Forfar. She still clearly loves adventuring, as she is currently traveling the country in a van with her wife. They run a blog about their adventures and are based out of Asheville, North Carolina. Their blog discusses Asheville and what to do, see, and play there. They also write about the National Parks, which Erin calls “some of our favorite playgrounds.” Right now, Erin and her wife are finishing up an assignment as Nation’s Vacation Ambassadors for Aramak. 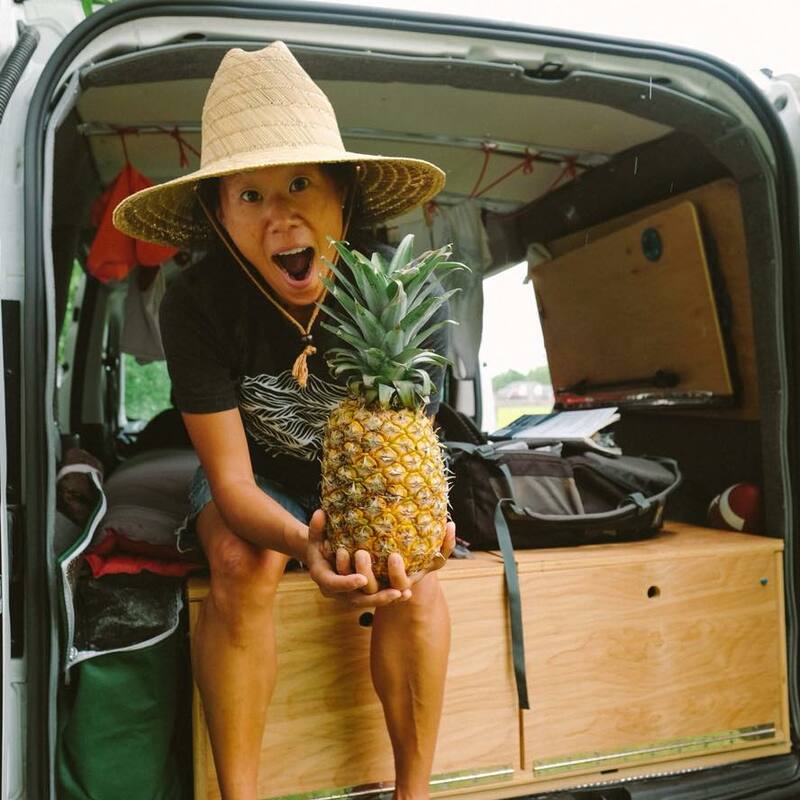 In her free time, Erin likes to surf, stand-up paddleboard, ride bikes, and trail run. She also enjoys finding new ramen restaurants and cool murals, and trying to find the perfect IPA. We wish Erin many happy trails as she explores the United States! Have fun! 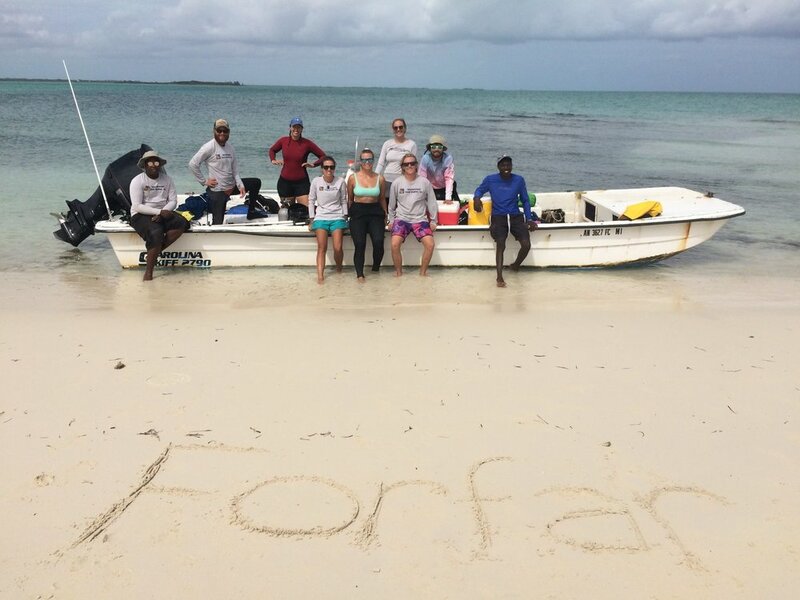 On October 22-23, 2018, Reef Rescue Network and staff from Forfar Field Station on Andros braved the high seas of the Tongue of the Ocean to complete the outplanting of Acropora fragments back to the local reef. Despite the far from optimal weather conditions, the crew ventured out beyond the reef crest of the Andros fringing-barrier reef to the coral propagation site. There, the divers, armed with loppers and milk crates, descended to the nursery. While half the divers were trimming fragments of Staghorn coral (Acropora cervicornis), the other half was roaming around underneath them catching the fragments with the crates. Divers then returned to the surface to drop off the full crates to the surface crew, who counted and carefully moved each fragment in a cooler full of sea water. The team then moved to the chosen outplanting site, Strings Quartet, on the back side of the reef. There, the divers went back down and attached the fragments using marine epoxy onto different rocks within the reef. The weather took a turn to the worst, with heavier winds and rain, preventing the team from getting back onto the reef and consequently forcing them to head back to the station to try again the next morning with the hope of better weather conditions. The following day the team was met with a similar forecast, which once again didn’t stop both divers and surface crew. 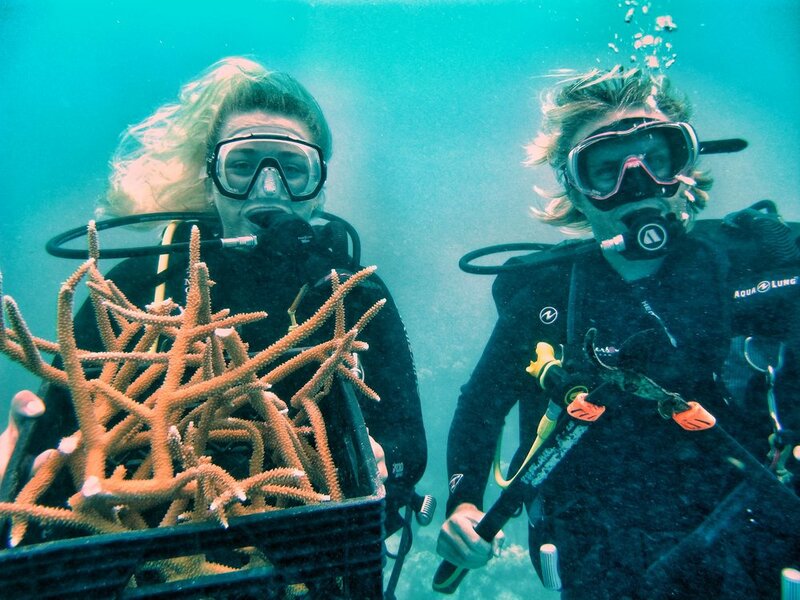 This time they readjusted their strategy: they outplanted 50 fragments of both Staghorn (Acropora cervicornis) and Fused Staghorn coral (Acropora prolifera) directly to the reef adjacent to the nursery to minimize stress factors for the coral. After a well-deserved lunchbreak on the nearby deserted and idyllic Pigeon Cay, the team headed back out for two more dives. They collected 39 more fragments of both coral types and outplanted them to another site along the reef called A-flats. Overall, these two intense days of fieldwork resulted in the outplanting of 126 Acropora fragments to the local reefs with the hope that they will grow strong and healthy. In the meantime, Forfar staff will be busy in the next upcoming weeks, trimming the remaining fragments of Elkhorn coral (Acropora palmata) from the nursery and outplanting them to Strings Quartet. It was a great two days of helping the Andros coral reef with amazing team work from both parties. Forfar staff loved getting out on the water while learning and gaining experience in coral reef restoration techniques. We look forward to collaborating again with Reef Rescue Network coordinator, Haley Jo Carr, in the following year for the next outplanting trip. Did you know that chemical-based sunscreens can be incredibly harmful to coral reefs and marine species? Sunscreens can contain two different forms of active ingredients to protect our skin, mineral and chemical filters. The sunscreens containing chemical filters including Oxybenzone (aka benzophenone), Butylparaben, Octinoxate, and 4-methylbenzylidene camphor have been found to negatively affect coral reefs and marine ecosystems - and in some cases, even human health. According to 2016 research in the Archives of Environmental Contamination and Toxicology, oxybenzone and octinoxate, causes coral bleaching and damages corals their ability to reproduce. When corals bleach they lose or expel the algae living inside them, losing a valuable source of nutrition. With 4,000-6,000 tons of sunscreen washing into our oceans every year, these chemicals are causing widespread damage (Downs et al. 2016). Organizations worldwide have been inspired to take action to limit the use of these chemicals in sunscreens. In July 2018, Hawaii Gov. David Ige signed a bill banning the sale of sunscreens containing oxybenzone and octinoxate. Eco-conscious companies are starting to make changes too; REI have promised to ban the use of oxybenzone in all their products by fall 2020. Craig Downs, researcher and Executive Director of a the scientific non-profit Haereticus Environmental Laboratory, spoke out on the importance of proper sunscreen use, explaining, “We have lost at least 80 percent of the coral reefs in the Caribbean. Any small effort to reduce oxybenzone pollution could mean that a coral reef survives a long, hot summer, or that a degraded area recovers" (Kotala 2015). In an effort to conserve our coral reefs and the environment of Andros, IFS will not allow guests to use sunscreens with unsafe chemicals. We aim to protect the reefs of Andros so future generations of students can continue using the space to learn and explore. It's important to remember we can all create sustainable habits to support large scale conservation efforts, and proper sunscreen use is an easy place to start. Don't use sunscreens that contain: Oxybenzone, Butylparaben, Octinoxate, or 4-methylbenzylidene camphor. Do use mineral based sunscreens with coated, non-nano ingredients like titanium oxide or zinc oxide like the ones found here and here. Also, check out the Environmental Working Groups Guide to Sunscreens. Avoid using spray sunscreens; aerosol products also hurt our environment. Wear clothing that protects from the sun; UV t-shirts, long-sleeve shirts, hats and rash guards. Thank you for understanding and taking steps to conserve the reefs of Andros! IFS is proud to announce that we are now offering historical tours of Nassau/New Providence in partnership with Woodside Transportation. This trip is a great option for groups that have a late departure time from the Nassau airport on their way back to the US. The scheduled flights for your group from Andros to Nassau will arrive in Nassau between 8 am and 9 am. If your departure flight to the US will be leaving after 3 pm, the Nassau tour will work well for your group and will provide ample time for the tour. We suggest that groups check-in for their international departure flight and check their bags with the airline before departing for the tour. The average length of this tour is between 3 and 4 hours long. The tour has a total cost of $25 per person (with lunch included). The tour focuses on visiting a number of historical sites throughout New Providence and includes a stop for lunch. The bus used for the tour has a capacity of 29 passengers and is driven by a licensed and insured professional driver. The driver will also act as your tour guide and will provide detailed information about each site you visit and many others that you will see while driving. They are very knowledgeable and are happy to answer any questions you may have. See below for additional details about the tour. To start the tour, your group will be picked up directly from the US Departures terminal at the Nassau airport. The first stop of the tour is at the New Providence caves. This site is a long cave system with closed passage and there are usually many fruit bats flying around throughout the site. Your group will take around 15 minutes to explore the caves and your tour guide will provide detailed historical information. Your next stop will be at Fort Charlotte. Built in 1788, at 100 acres in size, this is the largest fort on New Providence. 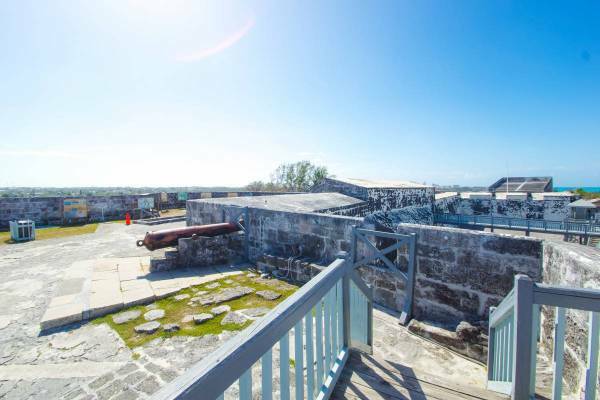 Your group will have the option to view the fort from the perimeter or pay a small $2 fee to gain access to the Fort and explore the site on foot. The next stop is at Fort Fincastle and the Queen's Staircase. This site can be viewed from the perimeter while still on the bus, or your group can pay an additional $5 fee to gain access to the Fort and explore the site on foot. After visiting Fort Fincastle the next stop of the tour is at Fort Montagu. This site is the oldest fort still standing on New Providence and was built in 1741! Your group will exit the tour bus and spend around 15 minutes exploring the site on foot. The next stop of the tour is lunch at Arawak Cay. Groups will typically have a fish fry that includes fried chicken or fish, a side of fries, and a drink (there is also a vegetarian salad option). This stop typically takes place around 12:15 or 12:30 PM and your group will have reserved seating and access to onsite bathrooms. If you're interested in other dining options, please contact the office to see what's available. When your group is finished with lunch, you will head back to the airport to check-in for your flight. The tour guide will plan to get you back to the airport around 2 hours before your flight departure. The typical drive time for the tour is around 1 hr and 15 minutes total with a maximum of 2 hours if traffic is very bad. There is no required paperwork for you or the students to complete. If you decide to book the tour, they will have a driver in the area around 8 am and they will be ready to pick you up from the airport with just a few minutes notice. If you're interested in receiving more details or would like to move forward with booking the tour, please contact the office.